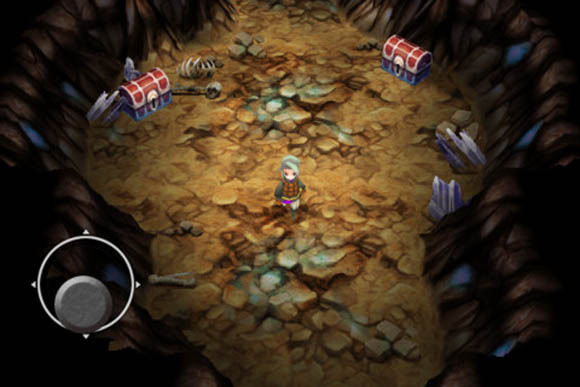 I've previously discussed my thought on the virtual d-pad implemented in FFI and FFII on iOS. It generally works fine, it just doesn't have the tactile feedback I'm used to with a controller. Final Fantasy III uses a virtual analog stick instead of a virtual d-pad and it's a totally different story. The virtual analog stick is extremely frustrating to use. The lack of tactical sensation makes it difficult to judge how far you actually have the analog stick pressed in one direction or another and which direction it's been pushed. Not only is it hard to judge but the stick location actually moves around the screen depending on where your thumb is touching. It's impossible to learn the area the virtual analog stick occupies because it is constantly moving every time you pick up your thumb and put it somewhere new. If it wasn't constantly moving around I could at least learn to use it by spending enough time with it. Final Fantasy III is a fully 3D game with 3D environments which means the player isn't confined to simple 4 direction movement like in FFI and FFII. This makes having a reliable and functional input device a key aspect of the game design. Unfortunately, it's sorely missing. So far the graphics, story, and gameplay are all good but every time I sit down to play I immediately get frustrated with the controls. I'll struggle my way through it for now and I'll write more once I'm farther into the game. I cannot stress enough how much I don't like touch interfaces for reasons like this. They are great for some games, but, like the Kinect, they just don't work for functions where you need haptic feedback. Humans are hardwired to undertsand touch, and taking the natural feedback of the real world out of touch interfaces is putting the player even further away from the game itself. It's just brutal in this game. It makes me not want to play. FFIII was definitely not made with a touch interface in mind.